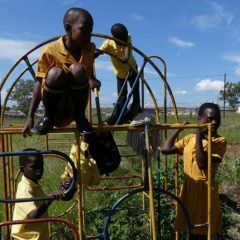 In Roosboom, orphaned and disadvantaged children from the Half Way House maintain 10 plots (by groups of 5), under supervision of a gardener who intervenes several days a month. 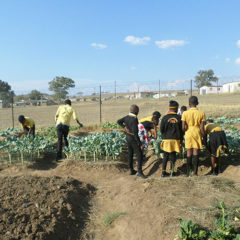 Produced vegetable (cabbage, zucchini, spinach …) are used in the preparation of hot meals for children. In Swaziland, Fundzisa Live’s garden provides salads and tomatoes for sandwiches distributed to HIV-positive patients at the hospital. In South Africa, permaculture was introduced several years ago as a development solution especially for townships, with the notion of “Door Gardens.” These gardens, the size of a door (2m x 1m), are adapted to suburban housing from townships, which often have a small fenced plot of a few square meters. the idea is to create on that small surface a fertile land, using household waste mixed with plants available nearby (leaves, branches, grass …) and to associate crops for maximum performance on a small surface to provide a dietary supplement with fresh vegetables for families throughout the year. The plots maintained by Ladysmith’s children follow the same principle. 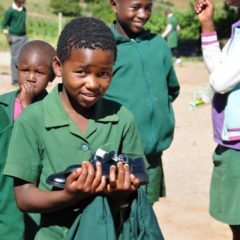 In Swaziland, the context is different, and families in rural areas are often discouraged from growing food, although they have the land, even though malnutrition is very widespread. 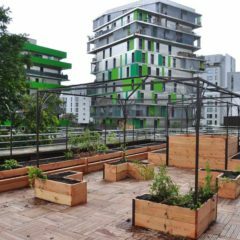 The belief that a garden requires a lot of space, a significant investment in chemicals, seeds (not reproducible) and a lot of water, discourages many engage in vegetable production. In addition, meat consumption although limited because very expensive, is very popular and often considered as being the most valuable nutriment for humans. Livestock is a significant investment that few can afford. The result is that food of the majority of vulnerable people is made up of cheap supermarket products: bread, rice, beans, cornmeal and sometimes a little meat (especially offal)… Vegetables are mostly used for sauces and nutrient values are, for the most part, ignored. In addition there are many varieties of edible indigenous plants and trees that are ignored by most people, even though they could provide interesting and free food supplements. A better understanding of what a balanced diet is, rehabilitation of edible indigenous resources and mastering basic cultivation techniques, can improve the health and quality of life of these people, especially in areas highly affected by HIV AIDS where strengthening the immune defenses is essential. With the support of The Ivory Foundation, the project managers of Ladysmith and Piggs Peak could participate in a 15-day training in Botswana in Botswana College of Agriculture (BCA), with several speakers specialists in innovative agricultural techniques. Topics included creation of fertile soil using local resources, making of compost, crop associations, irrigation control through mulching and culture on raised beds. A twinning was set up with the BCA and both Designing Hope’s projects so they can access to other innovative techniques such as Biochar and Bokashi, which was tested on both sites for a year . After this training, implementation was immediate on both sites in South Africa and Swaziland. Permaculture raised beds have been implemented, some incorporating biochar produced with residues from the exploitation of eucalyptus. Training was provided to women to make fermented plant juice made with plants collected locally (Bokashi technique). this free soil amender provides micro-organisms that support plant growth, especially when combined to Biochar. Designing Hope was supported by Kokopelli association and its “Seeds without Borders” initiative. A database was created to reference seeds, their growing conditions and benefits of different species. A nursery was set up in order to test the impact of Biochar and Bokashi on the growth of seedlings, women from Swaziland and children from the Ladysmith’s group being in charge of testing crops growth on each site. The first implemented permaculture raised beds showed the immediate effectiveness of these techniques: Below, you can see that in two months in Swaziland, seedlings of cabbage and spinach (third picture from the left) have reached a stage of maturity (4th picture) in record time on a bed made using the techniques of permaculture also incorporating biochar. Other tests in the nursery also show the positive impact of biochar on plant growth. -The Fundzisa Live garden in Piggs Peak is used as demonstration and pedagogical garden for women from the Voluntary Testing Center (TVC) at Piggs Peak Hospital. -It is also envisaged to settle a smaller garden on the hospital premises that can encourage women to learn more at Fundzisa Live’s support group garden located 500m away. -An Additional educational garden will be set up in a school in town (Peaks Central School), also trying to educate parents. -A Team of 4 women will be trained and equipped with basic agricultural tools to organize on-site training in selected communities around Piggs Peak. -A Comprehensive manual was made available to trainers, which will be popularized in the form of simplified comic books can be left during training. These courses are also new income-generating activities for women in the support group. 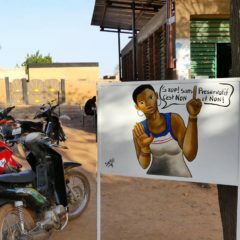 These activities contribute to breaking stigma affecting HIV patients, as they include them in training programs benefiting those around them, which promotes the creation of social links, and strengthens these women. 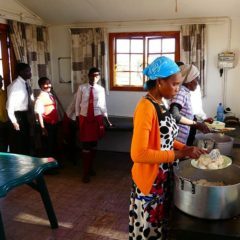 In Ladysmith, the training will focus mainly on the 50 children supported by the Half Way House, with a possible visit of the gardens by families living nearby, and extended families of children. Below, preparation of a circular crop bed under a tree. Growth of seedlings in 2 months time.